In 1609, Scottish and English settlers, known as planters, were given land confiscated from the native Irish in the Plantation of Ulster. Coupled with Protestant immigration to "unplanted" areas of Ulster, particularly Antrim and Down, this resulted in conflict between the native Catholics and the "planters". This led to two bloody ethno-religious conflicts known as the Irish Confederate Wars (1641–1653) and the Williamite war (1689–1691), both of which resulted in Protestant victories. British Protestant political dominance in Ireland was ensured by the passage of the penal laws that curtailed the religious, legal and political rights of anyone (including both Catholics and [Protestant] Dissenters, such as Presbyterians) who did not conform to the state church, the Anglican Church of Ireland. As the penal laws broke down in the latter part of the eighteenth century, there was more competition for land, as restrictions were lifted on the Catholic Irish ability to rent. With Roman Catholics allowed to buy land and enter trades from which they had formerly been banned, Protestant "Peep O'Day Boys" attacks on that community increased. In the 1790s Catholics in south Ulster organised as "The Defenders" and counter-attacked. This created polarisation between the communities and a dramatic reduction in reformers within the Protestant community which had been growing more receptive to ideas of democratic reform. Following the foundation of the nationalist-based Society of the United Irishmen by Presbyterians, Catholics and liberal Anglicans, and the resulting failed Irish Rebellion of 1798, sectarian violence between Catholics and Protestants continued. The Orange Order (founded in 1795), with its stated goal of upholding the Protestant faith and loyalty to William of Orange and his heirs, dates from this period and remains active to this day. In 1801, a new political framework was formed with the abolition of the Irish Parliament and incorporation of Ireland into the United Kingdom. The result was a closer tie between the former, largely pro-republican Presbyterians and Anglicans as part of a "loyal" Protestant community. Though Catholic Emancipation was achieved in 1829, in large part by Daniel O'Connell, largely eliminating legal discrimination against Catholics (around 75% of Ireland's population), Jews and Dissenters, O'Connell's long-term goals of Repeal of the 1801 Union and Home Rule were never achieved. The Home Rule movement served to define the divide between most nationalists (often Catholics), who sought the restoration of an Irish Parliament, and most unionists (often Protestants), who were afraid of being a minority in a Catholic-dominated Irish Parliament and tended to support continuing union with Britain. Unionists and Home-Rule advocates countered each other during the career of Charles Stuart Parnell, a repealer, and onwards. By the second decade of the 20th century Home Rule, or limited Irish self-government, was on the brink of being conceded due to the agitation of the Irish Parliamentary Party. In response, unionists, mostly Protestant and concentrated in Ulster, resisted both self-government and independence for Ireland, fearing for their future in an overwhelmingly Catholic country dominated by the Roman Catholic Church. 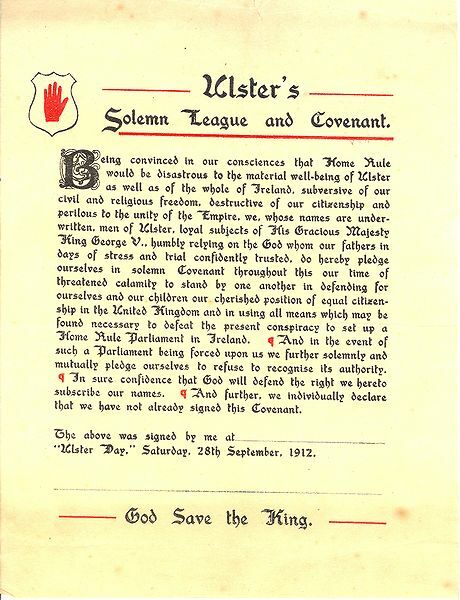 In 1912, unionists led by Edward Carson signed the Ulster Covenant and pledged to resist Home Rule by force if necessary. To this end, they formed the paramilitary Ulster Volunteers and imported arms from Germany (the Easter Rising insurrectionists did the same several years later). Nationalists formed the Irish Volunteers, whose ostensible goal was to oppose the Ulster Volunteers and ensure the enactment of the Third Home Rule Bill in the event of British or unionist recalcitrance. The outbreak of the First World War in 1914 temporarily averted the crisis of possible civil war and delayed the resolution of the question of Irish independence. Home Rule, though passed in the British Parliament with Royal Assent, was suspended for the duration of the war. Following the Easter Rising in Dublin in 1916 by the Irish Republican Brotherhood, and the executions of fifteen of the Rising's leaders, the Sinn Féin party won a majority of seats in Ireland and set up the First Dáil (Irish Parliament) in Dublin. Their victory was aided by the threat of conscription to the British Army. Ireland essentially seceded from the United Kingdom. 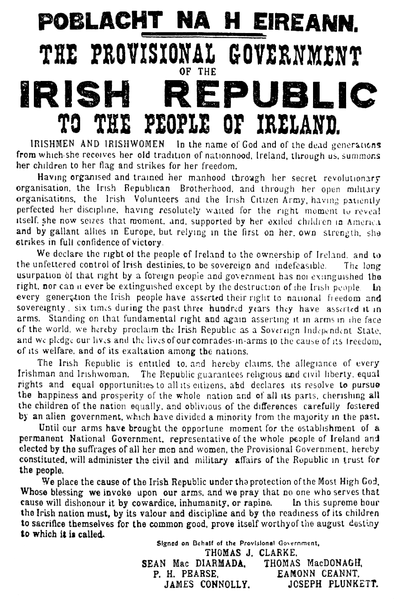 The Irish War for Independence followed, leading to eventual independence for the Republic of Ireland. In Ulster, however, and particularly in the six counties which became Northern Ireland, Sinn Féin fared poorly in the 1918 election, and Unionists won a strong majority. The Government of Ireland Act 1920 partitioned the island of Ireland into two separate jurisdictions, Southern Ireland and Northern Ireland, both devolved regions of the United Kingdom. This partition of Ireland was confirmed when the Parliament of Northern Ireland exercised its right in December 1922 under the Anglo-Irish Treaty of 1921 to opt out of the newly established Irish Free State. A part of the treaty signed in 1922, stated that a boundary commission would sit in due course to decide where the frontier of the northern state would be in relation to its southern neighbour. With the two key signatories from the South of Ireland dead during the Irish Civil War of 1922–23, this part of the treaty was given less priority by the new Southern Irish government led by Cosgrave and was quietly dropped. The idea of the boundary commission was to include as many of the nationalist and loyalist communities in their respective states as fairly as possible. Northern Ireland remained a part of the United Kingdom, albeit under a separate system of government whereby it was given its own Parliament and devolved government. While this arrangement met the desires of unionists to remain part of the United Kingdom, nationalists largely viewed the partition of Ireland as an illegal and arbitrary division of the island against the will of the majority of its people. They argued that the Northern Ireland state was neither legitimate nor democratic, but created with a deliberately gerrymandered unionist majority. Catholics initially composed about 33% of its population. Northern Ireland came into being in a violent manner – a total of 557 people were killed in political or sectarian violence from 1920 to 1922, during and after the Irish War of Independence. Most were Catholics. (See also; Irish War of Independence in the North East.) The result was communal strife between Catholics and Protestants, with nationalists characterising this violence, especially that in Belfast, as a "pogrom" against their community. A legacy of the Irish Civil War, later to have a major impact on Northern Ireland, was the survival of a marginalised remnant of the Irish Republican Army. It was illegal in both Irish states and ideologically committed to overthrowing them both, by force of arms, to re-establish the Irish Republic of 1919–1921. In response, the Northern Irish government passed the Civil Authorities (Special Powers) Act (Northern Ireland) 1922; this gave sweeping powers to the government and police to do virtually anything seen as necessary to re-establish or preserve law and order. The Act continued to be used against the nationalist community long after the violence of this period had come to an end. The two sides' positions became strictly defined following this period. From a unionist perspective, Northern Ireland's nationalists were inherently disloyal and determined to force Protestants and unionists into a united Ireland. In the 1970s, for instance, during the period when the British government was unsuccessfully attempting to implement the Sunningdale Agreement, then-Social Democratic and Labour Party (SDLP) councillor Hugh Logue described the agreement as the means by which unionists "will be trundled into a united Ireland". This threat was seen as justifying preferential treatment of unionists in housing, employment and other fields. The prevalence of large families and a more rapid population growth among Catholics was also seen as a threat. From a nationalist perspective, continued discrimination against Catholics only proved that Northern Ireland was an inherently corrupt, British-imposed state. The Republic of Ireland Taoiseach (Prime Minister) Charles Haughey, whose family had fled County Londonderry during the 1920s Troubles, described Northern Ireland as "a failed political entity". The Unionist government ignored Edward Carson's warning in 1921 that alienating Catholics would make Northern Ireland inherently unstable. After the early 1920s, there were occasional incidents of sectarian unrest in Northern Ireland. By the early 1960s Northern Ireland was fairly stable.